Also the kitchenette to our very neglected guest house/apartment above the garage. All original from the previous owners and literally never touched by us. A nasty combo of grease coated, rusted out, painted over, sticky back linoleum, vinyl, wood and laminate surfaces. (Seriously I was two seconds away from calling our plumber and having both the bathroom sink and kitchenette torn out.) I thought the job impossible. Only Eric knew to make me a deal. If concrete wouldn’t work I get new vanities. But if it does work I get Carte Blanche on the decor budget. Which would mean…(what he hates the most)…Accent Pillows! Lots and lots of accent pillows!😄 Deal accepted! So here is where we started…Cleaning 10+ years worth of gunk. Superbond and Henrys feather finish…They went together like peanut butter and jelly. However I must admit, I prefer working with the Encore kit. Their concrete was easier to control, smoother/fluid and a bit more durable as it dries. (Which is another reason why the project took so long, I wasn’t experienced working with this brand of concrete and more sanding was required between layers.) Yet it all came together, so we were confident enough to tackle the counters. Also quick reminder…Don’t forget to remove all the painters tape before the last coat of superbond dries. This will help immensely with clean sharp lines. 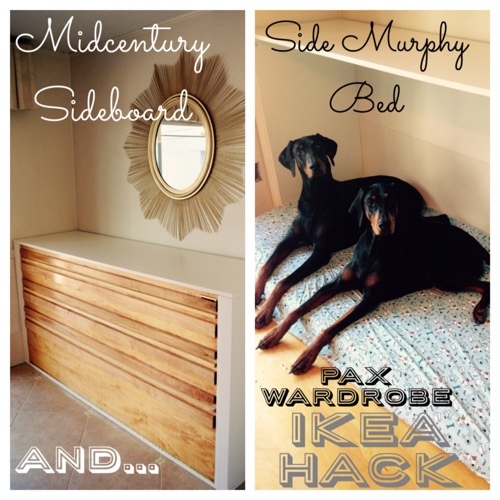 This time we’re not delving into all the details and steps on our countertops as we did here. Unfortunately we don’t have perfect “after” photos yet. We still have to silicone seal the sinks and clean before final photos can be shot. Overall so glad to check this one off the list!😀…Now I’m off! I have accent pillows to buy! Happy Sunday Everyone! Psst!..This is our 100th blog post today! And we’re finally on Instagram! Follow our guest house progress and check out the sneak peeks. …But it just wasn’t meant to be. Although the jasmin was not planted in a basket (the papyrus died so we had an extra tall pot sitting vacant) We instead wrapped it with green chicken wire to keep the dogs out. Also the sideyard is shaded and sheltered enough for the lillies and begonias withstand the summer heat. To conserve water/moisture we’ll probably add mulch to all the pots and baskets. We still have more updates for the sideyard and cleaning up but it feels good to cross another unfinished project off the list. This area is still one our favorite places to sit in the shade. Now you’ll know where I’m drinking my coffee this morning and beating the spring heat. Happy Sunday everyone! ﻿Every home dweller can relate to the unending list of projects or house maintenance. We often ignore certain issues and take the road of “if it ain’t broke, don’t fix it”. Only when something is glaringly ugly and/or integral breaks do we call the handyman or pull out the hammer. 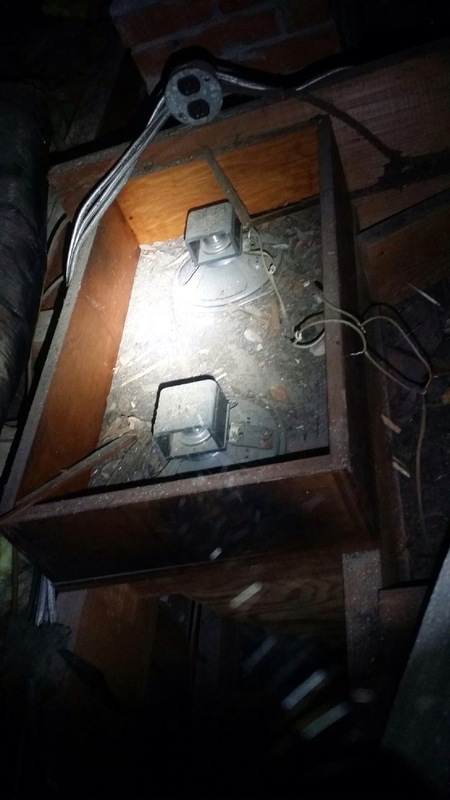 Unfortunately our only “after” reveal was replacing this rusted out 70s style outdoor light with a brand new “beachy” style one from homed depot. Yet having running hot water for guests is probably a good thing. We’re also setting up for (hopefully) another concrete countertop project. This time we’re tackling a mini bar, and bathroom. I’m crossing fingers that we’ll be done by next Sunday. Especially since countdown is now 30 days away! Yikes gotta get back to work! Unlike us, we hope you have an amazing weekend full of fun times. Don’t be like us kids, just say no to project procrastination. Or you end up digging holes and shoveling mulch on your Sunday. #TakeBackYourWeekends people! Happy Sunday everyone! Resurrecting 67 Year Old Sound! Do you remember our last picture of the built in’s speakers? If not, here they are again…. 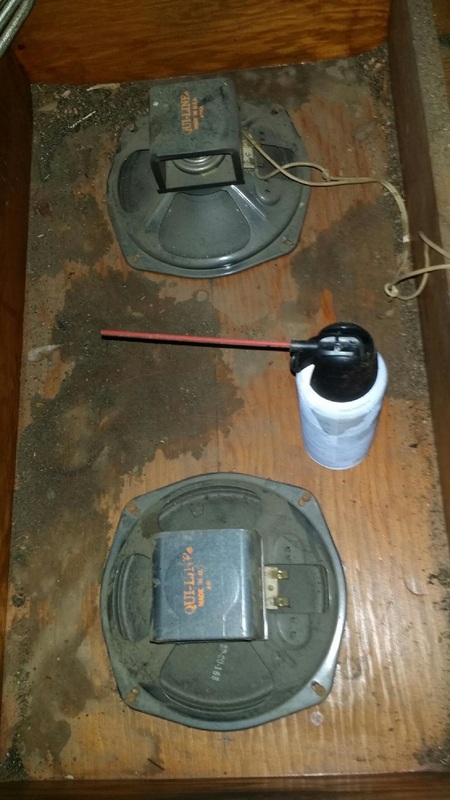 67 year old speakers in our attic, buried under roof debris, blown insulation and rat nests. (Oh yeah, our house originally came with a bad roof and a family of rats). For those of you new to the blog, in the last two years we’ve been “respectfully” renovating a 1948 home. In the beginning, it felt like the house was just one huge money pit. (New roof, water heater flooding our basement, evicting rats, etc) Yet in the last year we’ve managed a few fun projects, and finally feel like we’re making progress towards “beautifying” a house versus just “maintenance”. 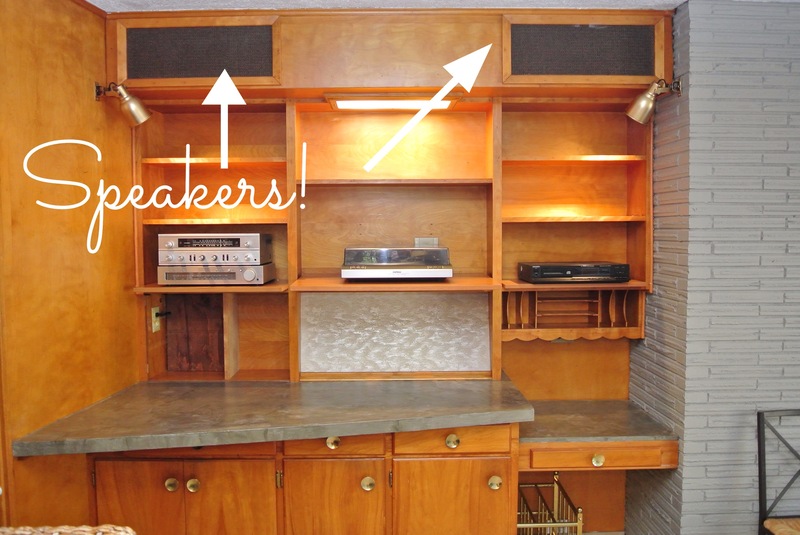 Some of the fun projects has been uncovering little surprises, like our Midcentury built in with speakers! We also found out our home was once a designer “showcase” house on the block. Hidden cabinetry, unique mid century details and amazing craftsmanship. In this case we chose to restore versus demo the built-in. Even though open concept is the popular thing our hearts (and wallets) weren’t in it. Now we’re glad we never picked up that sledgehammer. Especially when your electrician friend comes over to help replace the speakers. What we didn’t expect was this (ps. I apologize ahead of time, my voice sounds so annoying through a cell video. Quoting my brutally honest husband, “no hon, your voice does not sound like that in person, I think our readers will understand, and not want to punch you in the face😉”)~thanks hon, and hopefully you all don’t… Thank goodness hubby and friend were curious enough to test if the original speakers still worked! We expected (just based on first glance) there was no hope for them, that we’d have to pry off the built-in speaker grills and buy completely new ones. Instead we’re blown away Tony Bennett can still hold a note on these 67 year old speakers, despite years of abuse and neglect. Even though the quality could be improved we decided in the short term, use them till we lose them. Why replace when the point was to try to keep the original vintage qualities of the built in? 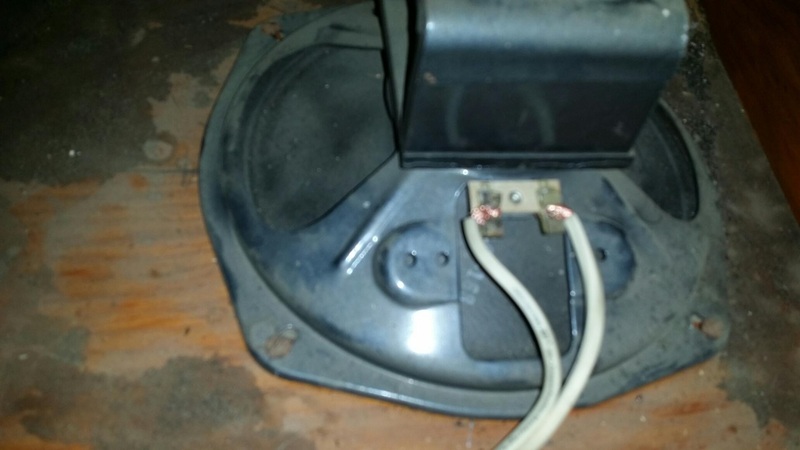 Hence our friend shuffled around in our attic for an hour, cleaning and rewiring at least one speaker on each side. We are really happy with keeping this vintage piece. All I need now is more vinyl and some staging ideas for the shelves. (Admittedly I have a severe “styling bookcase” disability) Any suggestions will be gladly appreciated😉. Happy Sunday everyone!